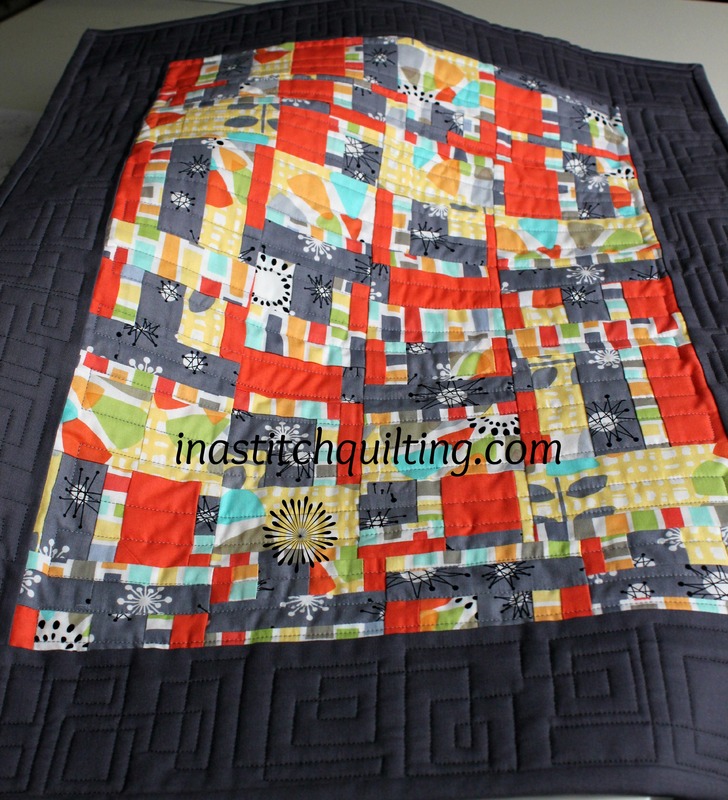 I belong to the national Modern Quilt Guild as well as the Madison Modern Quilt Guild. 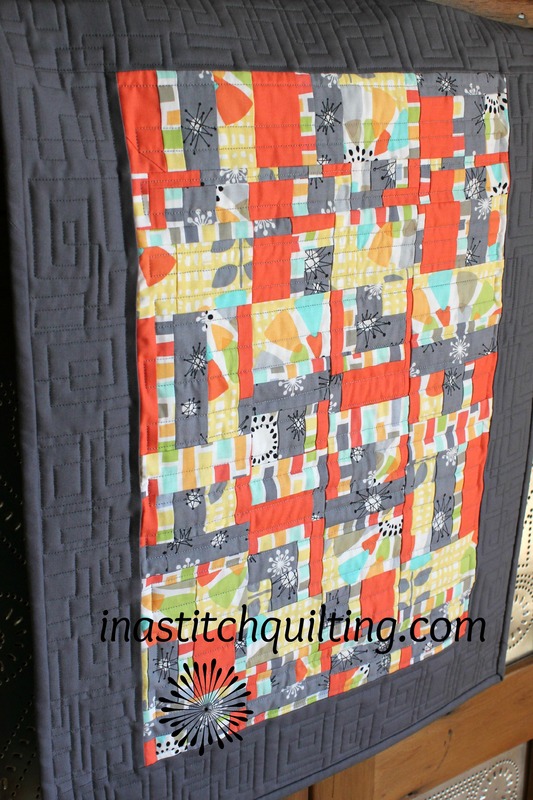 For the past three years the Modern Quilt Guild has held a members fabric challenge. This would be the first year I had the opportunity to participate. Fabrics for this year’s challenge were provided by Michael Miller. A bulk shipment of fabric was received by the local modern quilt guilds and then distributed to the members. How awesome to have the privilege to receive FREE fabric. I can’t think of any quilters that would want to turn it down. 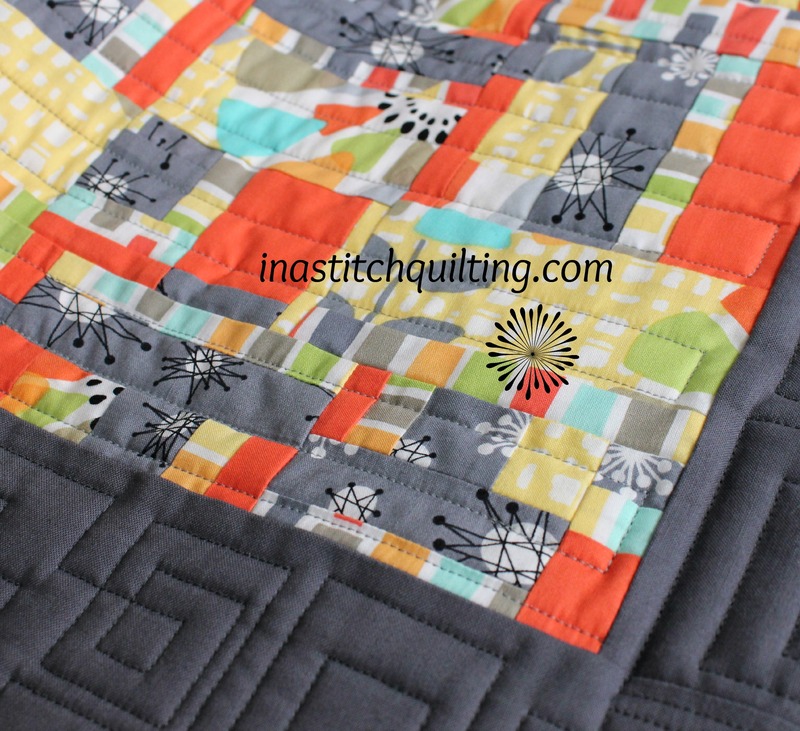 The fabric line for this year was Petal Pinwheels. The rules of the challenge were pretty simple. Create anything you want, provided it is quilted, using all or some of the fabric pieces received. Solids from other manufacturers could be added to the project but no prints. Additional yardage of the Petal Pinwheels could be purchased at your own expense. To be eligible for the prizes a photo(s) of your item had to be posted in the Modern Quilt Guild Forum. The deadline for posting your photo was July 25, 2014. Three lucky winners would be chosen by early August. To recognize their achievement each winner would receive a year of free fabric. 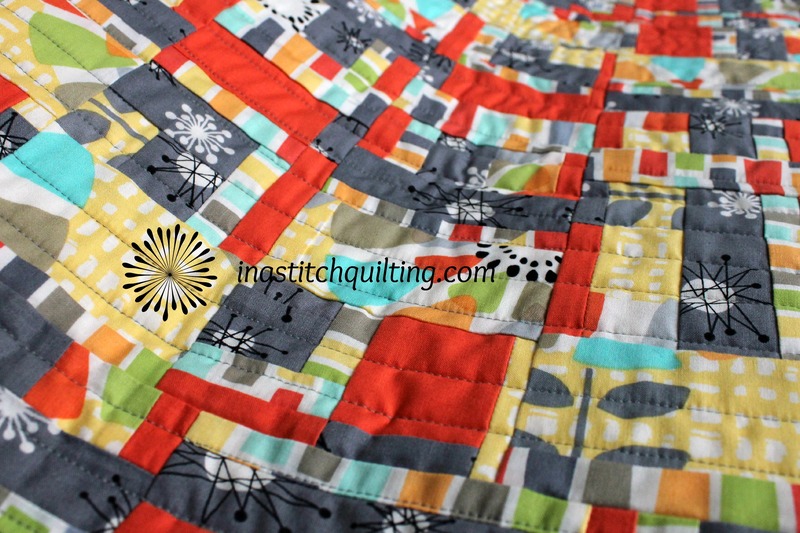 The Madison Modern Quilt Guild received and distributed six fat eights to its eligible members. I consider myself to be lucky to be one of those participating. The real challenge was deciding what to create. Originally I used the fabrics to make a simple but pretty table topper. Although I was pleased with the outcome I wasn’t quite sure it was putting my best foot forward. I set the project aside for a while to ponder its fate. After much contemplation I arrived at the conclusion that my project needed a bit of tweaking. The best way I know to make improvements is to lay my project on my cutting table, grab my rotary cutter and begin zipping away. Some people wouldn’t have the heart, even though they might not like what they see, to subject something they had made to such drastic measures. Instead they might give it away or hide it in their UFO (unfinished objects) box. As far as I am concerned, if I don’t like my project’s current status I have nothing to lose by changing it. Zipping my rotary cutter through the fabrics and seams is the best way I know to accomplish an improved outcome. 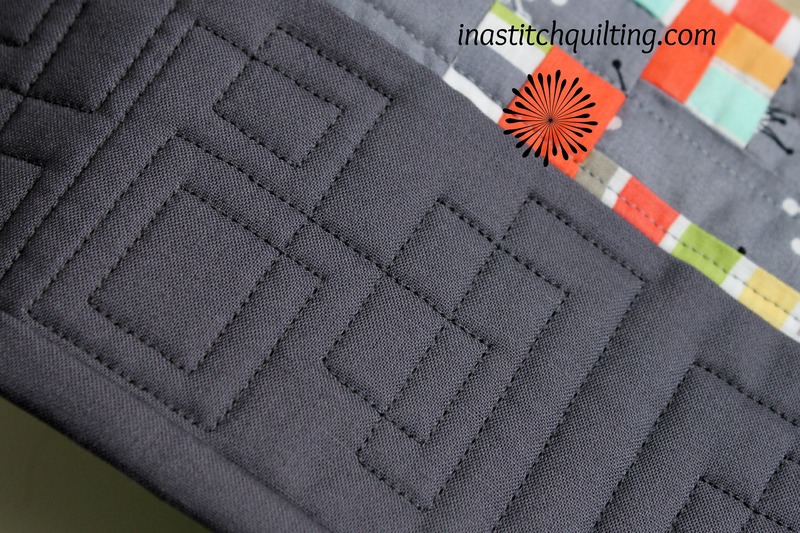 Besides, I tend to like free form quilting better anyway. I labored at deconstructing my original creation until I was satisfied with the pieces. Then I set about re-assembling the various segments into a new design. The rehabilitation process was slow but fruitful. What eventually transpired was a brand new wall hanging. Watching the flower, as I prefer to call it, unfold was pure joy. I was so totally pleased with its appearance and so very thankful that I had made the decision to press on towards perfection. I chose to surround my new blossom with a solid border fashioned from fabric I had on hand. Having fabric in my stash that complimented my project was a bonus. After quilting my refashioned creation, on my long-arm quilt machine, adding binding and a label I declared my project finished. I paused a moment to step back and admire my wall hanging. A big smile washed over my face. This was one project I was proud to say I had made. Not much time was wasted taking photos and uploading them to the Modern Quilt Guild website. There was no way I was going to miss out on the opportunity to gain recognition as well as compete for one of the three prizes. Although I certainly would love to win, in my heart I already consider myself triumphant. I have a brand new wall hanging to add to my collection. < It’s Going To Be Close!